The New Zealand Antarctic Society connects Antarcticans throughout New Zealand and around the world. The Society brings people interested in the Antarctic region together to share their knowledge with others, to foster interest in the region, to seek and support the protection of the Antarctic environment, and to promote New Zealand’s interests. The Society is incorporated and governed nationally by an elected council and regionally through three elected branch committees (Auckland, Wellington and Canterbury). 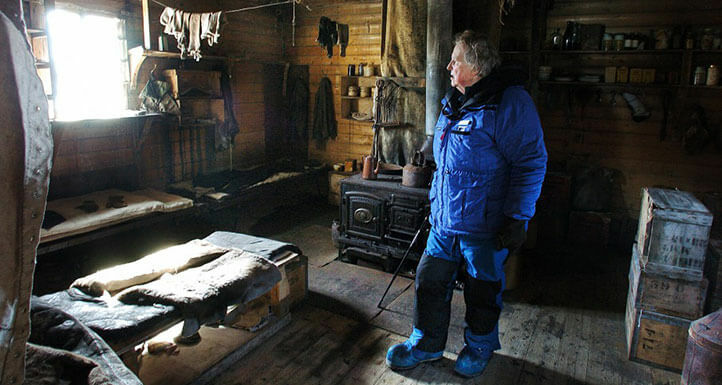 Former Patron Sir Edmund Hillary in Shackleton's hut. Photo Phil Reid © Antarctica New Zealand Pictorial Collection. One of the longest running Antarctic societies in the world. Read about how our history informs what we do today. The Society's Officers are elected by the membership. Find out who makes up the Society’s governing bodies. Opportunities on and off the Ice support the Society’s objectives, and give members openings to participate. Do you want to help shape the Society?